This training manual was developed for Peace Corps/Guinea by Herb Caudill and Ousmane Besseko Diallo. It features: 9 competences & 4 texts; funny pictures; dialogues; vocabulary; phrasebooks; grammar; exercises; cultural notes; reference tables; historical background; and lots of unsolicited advice. You will need Acrobat Reader to view or print this document. Pular is spoken in the area that once comprised the theocratic kingdom of the Fuuta Jallon (most of which is in modern-day Guinea). Other dialects in the area are Fulakunda, spoken in Casamance (southern Senegal) and parts of Guinea-Bissau and Gambia; and Pulaar, the language of the Toroobhe (Toucouleur) in Northern and southeastern Senegal and southern Mauritania (as well as in Dinguiraye in Guinea). Other forms of Pular are spoken in Niger, Mali, Nigeria, Burkina Faso, and Cameroon. 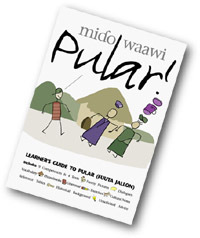 Linguists sometimes refer to Pular and its first cousins by the generic name of Fulfulde. It is a useful language in West Africa, not only because it has relatives in so many different countries, but also because the Fulbhe-Fuuta are everywhere. As a result of large emigration movements over the last 50-60 years, every West African capital has a colony of Fulbhe traders, merchants, etc. 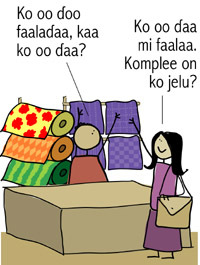 Today there are over 2.5 million speakers of the Fuuta Jallon dialect, out of around 14 million Pular speakers total.